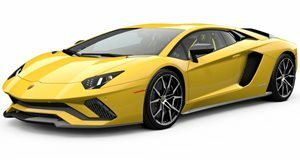 Lambo to Present Aventador Roadster Next Week? The open-top variant of Lamborghini's latest V12 supercar is tipped to be unveiled in Florida next week before its motor show debut in LA later this month. According to reports circulating the internet, Lamborghini will unveil the new Aventador Roadster in Miami next week just ahead of its official debut at the LA Auto Show later this month. We have few specifics regarding the Aventador Roadster&apos;s specs, but we&apos;re expecting it to chop the coupe&apos;s roof off in favor of a two-piece folding carbon fiber setup. Sources anticipate it will be a removable assembly that stores over the engine, rather than an automatic folding mechanism. The roof system, then, would be closer to the single removable panel used in the Diablo VT Roadster than the canvas umbrella found on the Murcielago Roadster. Styling should follow along the lines of the one-off Aventador J roadster unveiled in Geneva and pictured here, but with a proper windshield. Expect the 700-horsepower V12 and all-wheel-drive sequential drivetrain to carry over unchanged from the Aventador coupe, though. For now we&apos;ll have to sit back and wait until November 12 when the production roadster is expected to bow for the first time.